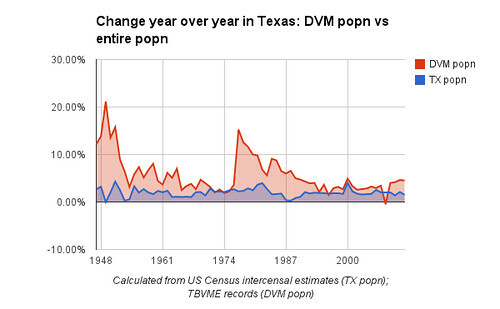 Objective evidence shows that there is, in fact, a statistical increase in the veterinary provider population relative to the total population in Texas. This is in sharp contrast to what we found in Michigan. 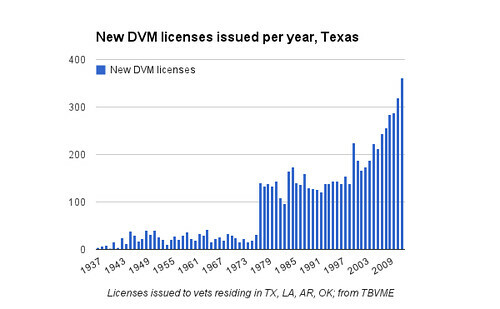 The current pressure felt by veterinarians in Texas however, is not simply a function of new licenses, but is due in large part to the cumulative numbers of licensees, particularly the sharp increase in licenses granted in the late 1970's and '80's. "I’m very excited about our economics work, and I’m particularly excited about finally identifying Mike Dicks (PhD) to head the AVMA Veterinary Economics Division. It’s been a long time coming, because we were careful to find the right person. I’m very impressed with Dr. Dicks’ skill set; he has real-world experience as well as an academic background. He’ll help AVMA make sense of the workforce data and plan our next steps." Dr. Dicks has made noticeable efforts to expand his grasp of the veterinary industry/profession by engaging with veterinarians around the country, including some blog interactions and e-mail exchanges with us over the past year. No doubt our argument (condensed version here) for basing industry/profession strategic decisions upon objective, timely, comprehensive and relevant data has resonated to some degree with Dr. Dicks. We've shared similar analogies, arguing that our profession ought to manage this economic crisis as we would a patient in our care (Ours, His). We're glad to see the industry has at least one insider, and an influential one at that, who shares our philosophy. We agree with Dr. Dicks that solid research is in order. Frankly, the lack of scientific thinking and objective evidence coming from the mouths and pens of the influential players on the veterinary professional stage is embarrassing. These same figures acting in their capacity as researchers at their veterinary teaching hospitals would be censured by their institutional ethics boards, have their publications retracted, and lose funding for proceeding with similarly shaky science. CEOs basing staffing strategies upon similar evidence would be called before share-holders, and their tenure would be shortened due to their businesses’ poor performance. But there appears to be a different modus operandi among veterinary professional leadership. 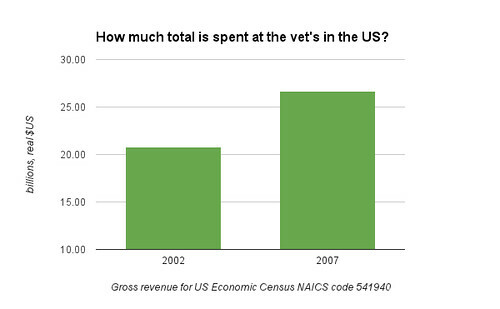 For instance, Dr. Eleanor Green, DVM, DACVIM, DABVP, dean of the Texas A&M University College of Veterinary Medicine, said at the Banfield Pet Health Summit on August 13, “There is no oversupply of veterinarians - there is underdemand.” Perhaps this is so, but to our knowledge such an assertion has no objective evidence to support it. In fact, there is objective evidence that demand nationally is growing. 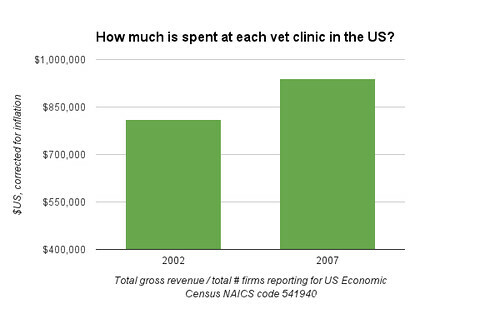 Both the total amount spent at veterinary facilities and the amount spent per clinic increased from 2002 to 2007 as documented in the US Economic Census. We'd really like Dr. Green to make public the evidence for her assertion that there's no oversupply. Objective evidence shows that there is, in fact, a statistical increase in the veterinary provider population relative to the general population right there in Texas. 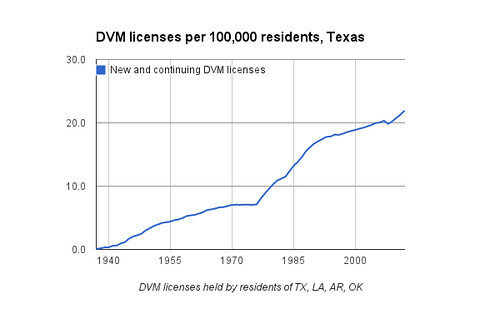 OK, somebody from Texas please chime in and let us know what happened in 1977 to skyrocket the number of new licenses? We need a history lesson. *This just in from reader Joe Hillhouse DVM in the Panhandle region of Texas: 1977 is when LSU CVM graduated it's first class. There ya go. Thanks, Joe! ** Totally not what it ended up being; Joe continued to dig and helped me figure out my algorithm missed a small subset of licenses prior to 1977. Since the numbers after 1977 aren't affected, I couldn't justify changing them. 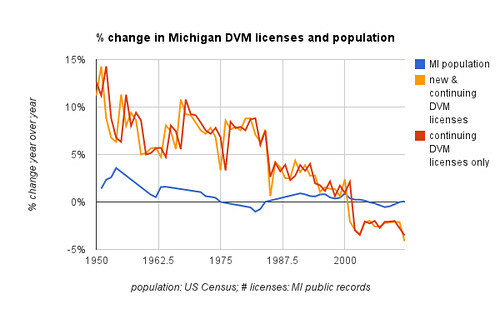 The absolute numbers were lower than the numbers getting licensed now, but on a per population basis the numbers of new licenses issued in the 70s and 80s meant the DVM provider population increased at a much higher rate than the general population form 1977 to 1993. 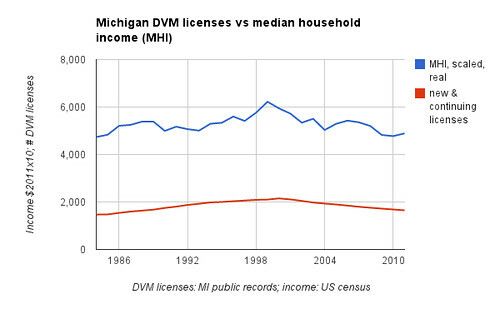 While there are more new licenses issued now per year, the difference in growth rates between the two populations has been much smaller since 1993. 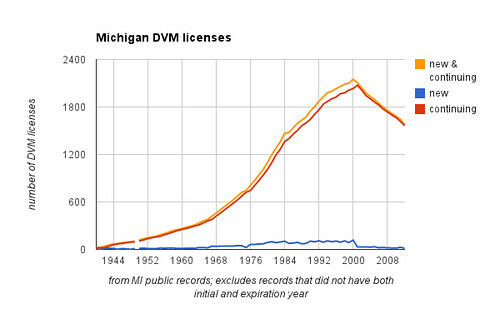 A note about the licenses that are included in the analyses from which these slides were drawn: these analyses include licenses issued by the TBVME that have an issue date, an expiration date, and an address in Texas or an adjacent state. The rationale for including Texas licenses held by vets listing an address in the adjacent states of Oklahoma (OK), Louisiana (LA) or Arkansas (AR) is that Texas has major metropolitan areas close to those state lines. 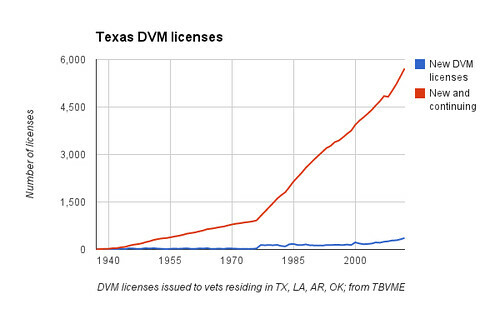 Thus a significant proportion of the relatively small number of such licenses may be vets crossing a state line to provide service in Texas, just as vets in Texas may hold licenses in other states. An example: vets in the Panhandle who routinely enough cross state lines to provide services that they carry five licenses. 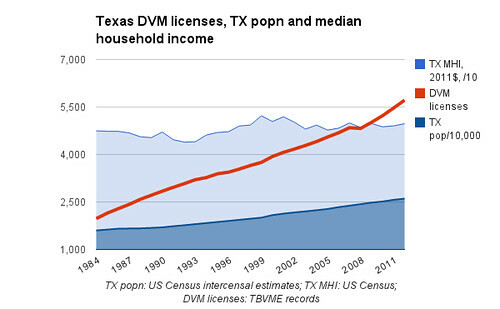 Some non-resident licensees are not providing services in Texas, surely- but some of those resident in Texas are not providing the maximum output of services either. This is not necessarily meant to be an exhaustive analysis- just a demonstration of how objective data that's already out there can be used to assess the situation. So, what's the situation in Texas? Looking particularly at the graph above, it becomes more visible that any overpopulation pressure currently perceived is due more to the additions in the 70s and 80s. 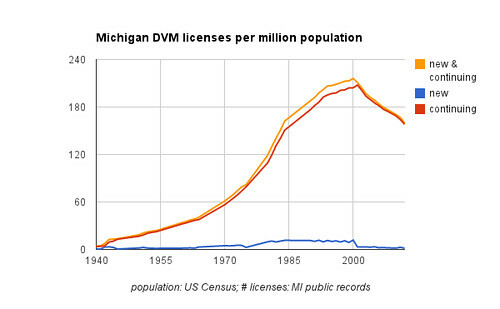 As those licensees reach the 40 year mark and begin retiring, around 2017, any perception of overpopulation should ease. In fact, should population growth and economic recovery both continue, demand will increase. Any dramatic or long term efforts at this point to decrease the licensee population could snowball into genuine shortages by 2027 as retirement accelerates. Of course, making decisions based on current, comprehensive, accurate, relevant, objective data would allow timely adjustments and thus make minimizing such overcorrections more feasible. We can even break this down on a county-by-county level to isolate particular markets. 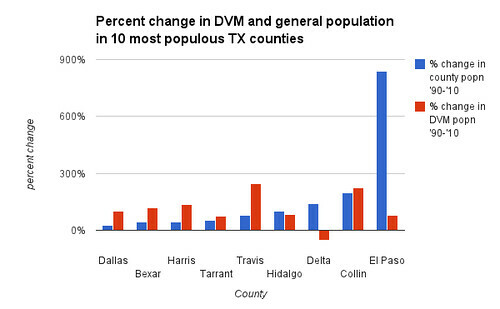 Here's the ten most urban counties in Texas, where we assume the DVM licensees are entirely companion animal. Not much of a pattern there that we can see. That just means we haven't identified the various factors that are driving growth in the two different populations in each county. It does reveal that different factors *are* driving the growth of the two different populations. These could be factors such as ethnic composition, or source of population growth or socioeconomic disparities, that may be present in one county but not another despite the similarity in urbanity and population density. One wonders what an exam of the ten counties with the largest cattle populations would show... too bad the US government doesn't consider that data essential. Our question to you, the reader: What can you make of this data? The authors gratefully acknowledge the comments offered in critique by David Welch and Billy Walker, and look forward to being able to enact the suggestions provided by their insight as time and resources allow. The topic “A Tale of Two States: Oversupply and Underdemand in TX compared to MI” seems like interesting but i have no experience in this particular field. Want to check my passion then visit https://marvelous-reviews.com/rushessay-com-review/ now and find some amazing educational & writing services online in your budget range and also in easy terms and conditions. I’m greatly impressed by this post. And by using http://www.glendale.edu/index.aspx?page=4593 external scholarships you’ll get a great opportunity to practice your skills and win some money.